What do you do with bored kids during summer break while on an island? Swipe up some ping pong paddles, a plastic wiffle ball, hit the tennis court and invent one of the hottest growing racket sports in the nation today—Pickleball! It was in 1965, on Bainbridge Island, that Congressman Joel Pritchard and vacationing neighbors, Bill Bell and Barney McCallum came up with the game that was born of boredom. But soon the kids were pushed courtside so the grownups could play and when summer ended, McCallum, who’d fashioned the first pickleball paddle prototype in his garage while on the island, took it back to his hometown streets of Seattle. Neighbor to neighbor the sport grew; from putting in a backyard court for everybody to play on to taking it on the road for Pritchard’s fundraisers and political events as he ran for reelection. A courtship (pardon the pun) between badminton, tennis and ping pong, pickleball has nearly three million players now taking to the court in the U.S. alone. It’s spread over the border to Canada and traveled the seas to Europe, and now China, even catching the ears of the International Olympic Committee. The Umpqua Valley Tennis Center and Seven Feathers Casino Resort have teamed up for the first annual championship tournament to be held in Roseburg February 8 – 10. Nearly 200 players from around the country will compete in several categories. Seven Feathers Entertainment Manager, Harold Phillips, is excited to see where the new partnership will lead. Former San Francisco 49ers player, Don Teague from Grants Pass, took up the sport almost three years ago and is now playing competitively. 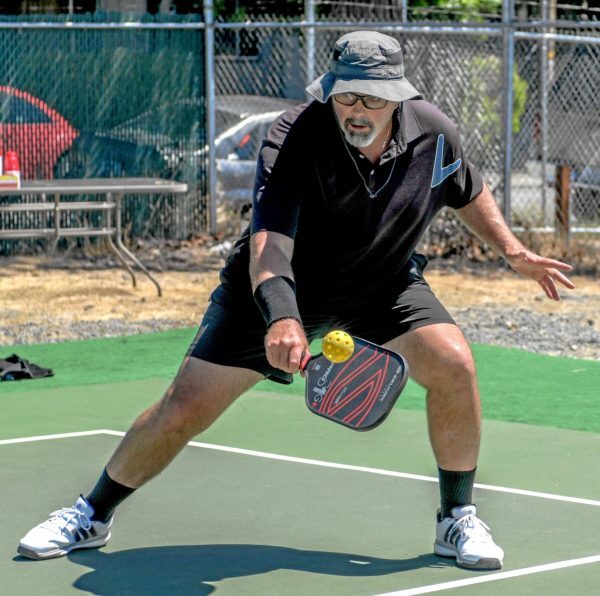 Teague will partner with USAPA Ambassador and pickleball instructor, Dave Johnson, from Southern Oregon Pickleball Association (SOPA), in the men’s doubles at the tournament. And it’s growing exponentially in the senior age group. Less impact and running may be some key reasons, Teague believes.